Dominion Ministries is a community of people who Live Love and Laugh. We are here to love God, Love people and Serve both. We understand that everyone is at a different stage in life. Our goal is to walk with you and grow with you. You don’t need to live in the Nashville area to join us. We are a global ministry a focus on bringing the best out of everyone and equipping those we have been entrusted with to live their best yet . Its time to Walk in Dominion in every area of our lives. Our members are located in several countries and continents. We are a church without walls and borders. You equipping and create opportunities for you to work in the vineyard. Let someone know you’re new here! Feel free to stop to talk to anyone in our congregation, including our You should also stop by the information desk to sign up for our revolutionary morning text messages. The word of the Lord is a practical manual created by our maker to guide us through walk on this earth. Let’s equip ourselves to walk in style- walk in dominion. Its time to PUSH- Pray Until Something Happens. 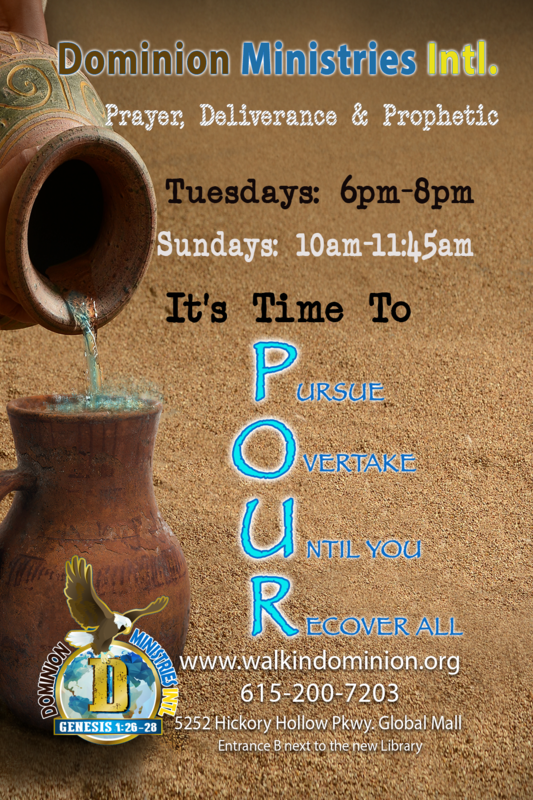 Its time to POUR – Pursue Overtake Until U Recover all. Our Operation LMPG “Let My People Go” on Tuesdays, Youth Lift Me Up on Thursdays and daily Operation PUSH have equipped many believers globally. In Luke 18:1 Jesus admonishes believers that “men ought always to pray and not faint”. For most of today’s believers, the FAINTING comes before the PRAYING. Through corporate prayer, we build our inner man up for effective individual prayers. Pastors Chris & Gina. (PC & PG).